Anthropology: Appreciating Human Diversity offers an up-to-date holistic introduction to general anthropology from the four-field perspective. 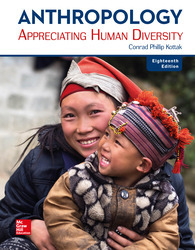 Key themes of appreciating the experiences students bring to the classroom, appreciating human diversity, and appreciating the field of anthropology are showcased throughout the text. The program presents anthropology’s core concepts and also demonstrates anthropology’s relevance to the 21st-century world we inhabit.